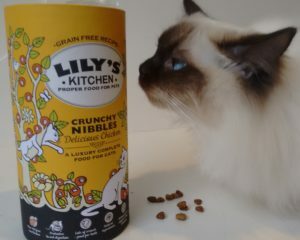 Lily’s Kitchen Crunchy Nibbles cat food was a special treat for our kitties here at MDM. Because our cats are on a prescription diet most of the time, we like to give them something to spice up their pallets and have them able to indulge in a treat every now and again. Lily’s was a great food to test out on our cats because not only is it an all-natural food, but it also has many health benefits incorporated into their formula, to act as an overall balanced diet for cats and kittens alike. The key benefits from this food that really stood out to us were a digestive formula with added probiotics, the crunchy outer shell which aided in helping with clean and tartar free teeth, and omega 3 fatty acids that not only help with a shiny and healthy coat, but help our younger kittens grow and develop properly. This food is a great alternative for those who want to keep their pets on a healthy, natural and balanced diet, all the while staying away from generic “filer” filled grocery store alternatives.